Present Status : Declared enemy of Chronos and the most powerful member of the CRTF, as well as a sworn ally to the Nova Guyvers. Description : Subject was a former member of a secret Chinese black Op’s division, that was infiltrated and destroyed when Chronos finally took full control over China. The subject was then captured, along with her partner Syn. Both where to be subjected to become zoanoid test subjects, but both eventually escaped. The subject has since bonded with a prototype Black Nova Guyver unit, with immense gravitational power, that has been further enhanced, by an upgrade module acquired by Dreadnought after his return from an alternate reality where the Nova project had been completed, to a power level that nearly rivals that of Dreadnought himself. Making the subject one of the most powerful beings on the planet. -Physical strength: Subject possesses the strength of 2,500 men and has nearly unlimited stamina due to a quantum singularity, which is the primary source of this Units immense gravitational power. -In place of Units Hyper Sensors, the subject has a polymorphic material that normally takes the form of greyish white hair. The subject can use this hair as whip like vibrational sword weapon, with a variable range that has been known to reach up to 30 feet. Though subject doesn’t have standard Guyver hyper preceptors, the subject has enhanced sensory perceptions and can sense both energy and gravitational fields to a sensitivity level that lets subject detect objects for a range of up to 10 km (~6.2 Miles) but can also focus her senses to let her detect objects up to 50 km (~31 Miles). The subject can also use the polymorphic material to fire a hail of dart like vibrational strands in almost any direction and is often used in tandem with units head beam. -Durability: Subject can withstand a 3 kiloton explosion unshielded, due to subjects high molecular density, static gravity field, and power level, and can withstand anything up to a 25 kiloton explosion with full shields. Estimated regeneration rate is at least forty times faster than normal for a Guyver. The subject can also absorb almost any form of energy directed at it at a rate approximately equal to 51.2 giga joules per second, making subject very difficult to damage. -Speed: Subjects has a reflex speed that ranges from 100 to 1,000 times normal, a top ground speed of up to 3,750 MPH, and a top air speed of 45,000 MPH. -Subject Head Beam has fifty times the energy output of a standard unit. -Subject has two pairs of elbow swords and two pair of forearm swords. Though they appear to be standard Guyver vibrational weapons, they have a much higher tolerance level due to subjects high power level and greater than normal density. The subject has also demonstrated the ability to channel part of its gravitational power through swords to either enhance them and/or to fire pressure cannon blade blasts. -Subjects Mega Smashers are 2 times more powerful than a normal Gigantic Guyvers. -Hyper Lens Flare: Subject can create a gravitational vortex in front of her that she can then release the full power of her mega smashers into. The subject can then either release all the energy in a single powerful ball of destructive energy, equal to ten times the subjects normal mega smasher power output, and/or redirect the energy through a wormhole and hit her target from virtually any angle and distance at will. -Subject has no sonic emitters but can easily create gravitational shock waves to produce the same effect and up to forty times the intensity of a normal Guyvers. -Gravitational powers are this units primary source of power. The Units CM contains a piece of an experimental Zoacrystal that contains an artificial quantum singularity and is the primary source of this Units gravitational power. The subjects body crystals are secondary gravitational control devices that help channel and control the subjects immense gravitational energy. The subject also has a standard Guyver gravity control orb. This grants the subject all the combined gravitational powers of a Gigantic Guyver and a Supreme Zoalord, but at a much higher power level. The subject can fire up to ten Zoalord type black hole attacks in one second or a single pressure cannon blast, with 15 times the destructive power of a normal Guyvers full double Mega Smash. The subjects shield can even be used to affect space/time around subject for up to 300 meters. Effects range from simple gravitational shock waves to slowing time to 1/1000 normal, the later effect allows subject to appear incredibly fast to targets within the affected area. -Gravity Field Matrix: An ability that lets subject manipulate gravitational energy at distances up to several kilometres from herself. Allowing her to change the direction of an attack, as well as power level, at will. Easily allowing the subject to turn a simple pressure cannon into either a guided projectile and/or suddenly increase its power to that of a black hole attack. This powerful ability is limited only by subjects power and imagination. 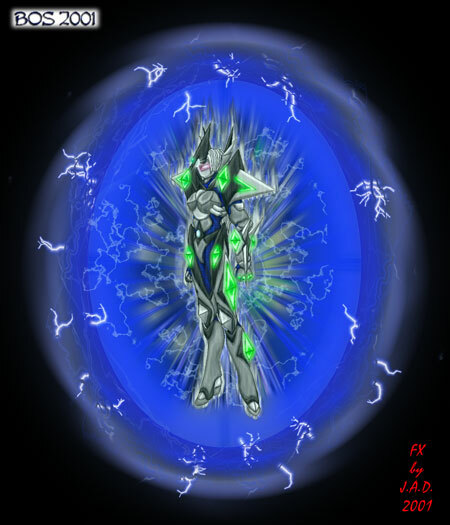 -Other Gravitational powers include a gravity shield attack similar to the Warrior Guyvers, this allows subject to create a powerful enough gravitational energy charge to create worm holes for teleportation and for short bursts of faster than light travel, as well as direct it for extremely powerful attacks. The subject can also use its gravitational power to cloak itself by bending all E.M. radiation, including light, around itself. This cloak effect can also be used to distort targets sensory perceptions and/or to create false images of subject and surrounding objects, similar to the visual affects of a carnivals fun house of mirrors. -Subject is also able to use its gravitational power to put itself out of phase with normal matter, which allows subject to pass through most objects like a ghost. The subject may also be able to do this by warping space/time enough to move the molecules of an object around itself as it passes through, though this may be fatal to a living being, most normal matter would appear to become liquid as the subject passes through. -Lightning Storm Flash: Subject can use gravitational power to ionize surrounding atmosphere and channel the resulting charge for either defence, electrified shield, or offense, either a directed bolt of energy that can be combined with a gravitational attack or released physically to enhance the affect of any physical blows upon a target (when combined with gravitational powers this attack can easily magnify the subjects punch or kick to four times their normal power). The power of this ability varies but can easily produce the equivalent power of a Guyvers Mega Smashers.